Sauces and vinigarettes | Life's Conundrum - Eat to Live or Live to Eat? Both of us are not keen on pesto that comes in a jar as it tends to be too oily (although both our kids love it!) and we have finally hit upon a homemade version which hopefully is worthy of getting an Italian’s seal of approval. 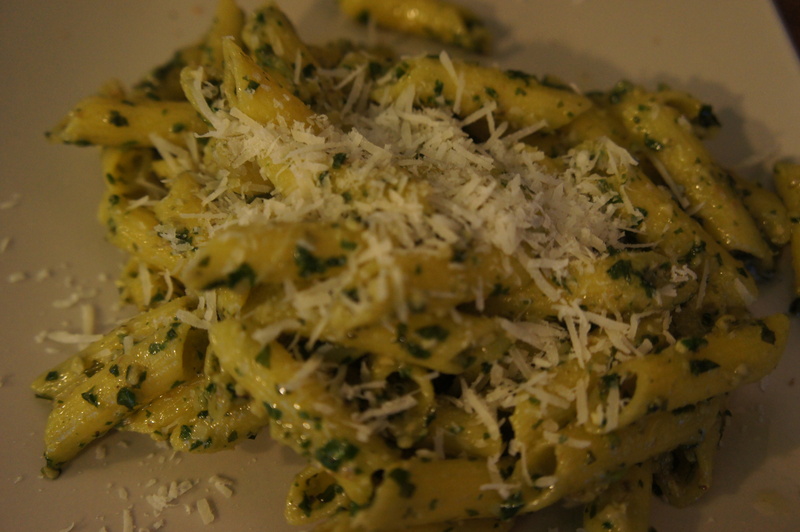 We didn’t have any pine nuts or grated Parmesan cheese but we think walnuts and Pecorino Romano works just as well. 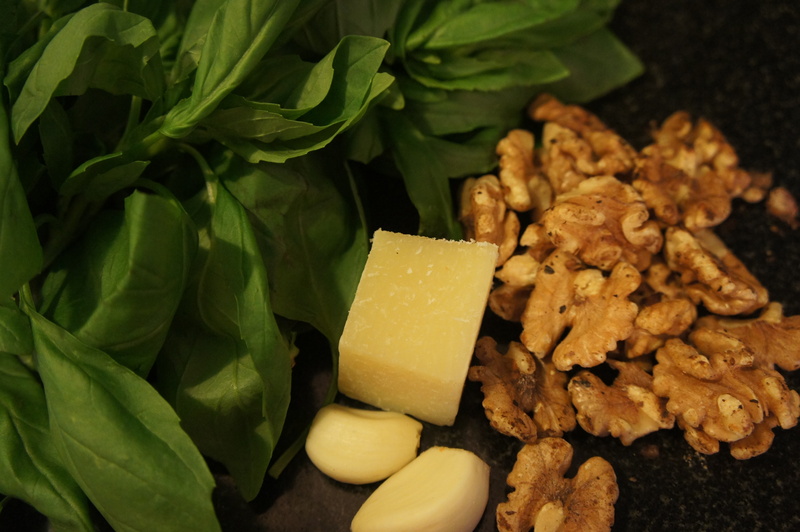 The addition of walnut oil accentuates the taste of the walnuts in the pesto. We had it for lunch today with some penne and tricolore salad. 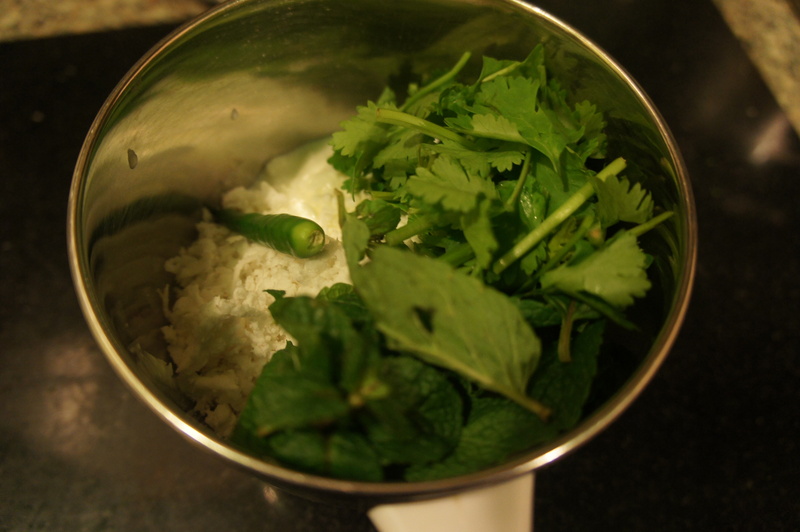 Place the basil, garlic and walnut in a mixer or pestle and mortar and blend to a coarse paste. Add the oils, cheese and adjust the seasoning. Use it with your favourite pasta or as a spread on some grilled ciabata. We had a relative visit us over the weekend and had prepared some of Anna’s mum’s dry roast chicken curry as a snack. We had some left over and this has formed the inspiration for this salad. 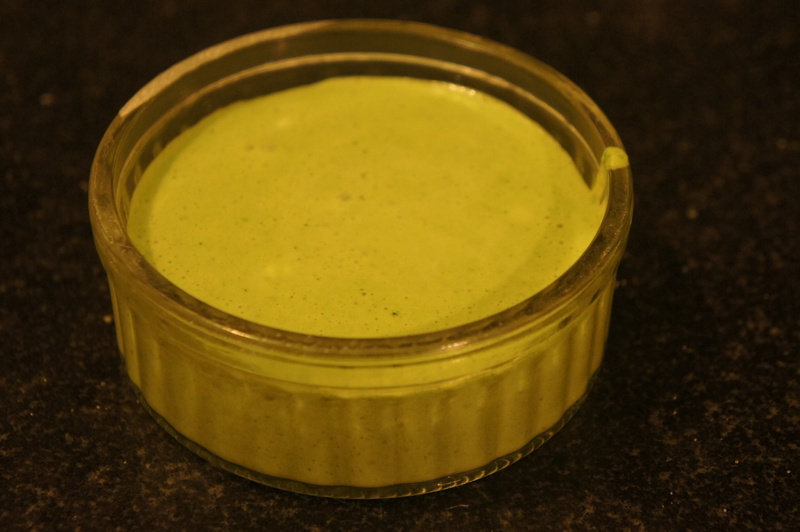 The dressing is simple to make and probably could work well with any Indian grilled/baked chicken dish (ie. tandoori chicken or chicken tikka masala). The recipe for the chicken (Chicken Ularthiyathu) was posted in an earlier blog – link below. 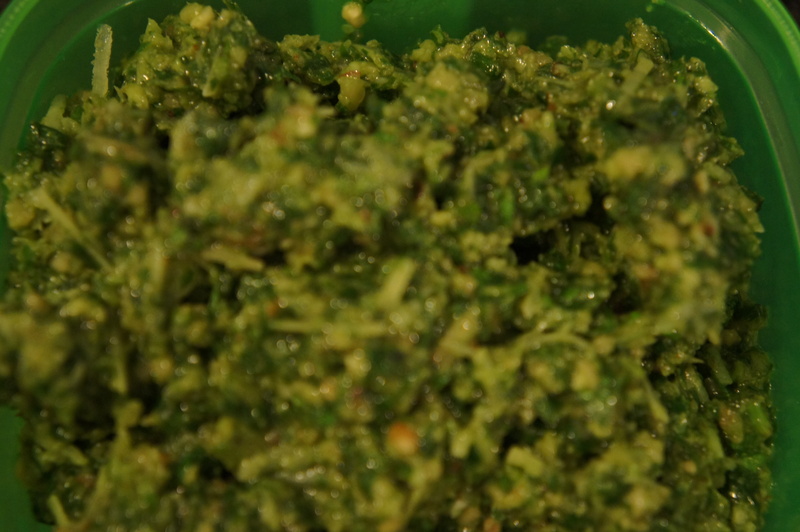 Place all the ingredients in a food processor and blend to a fine paste. 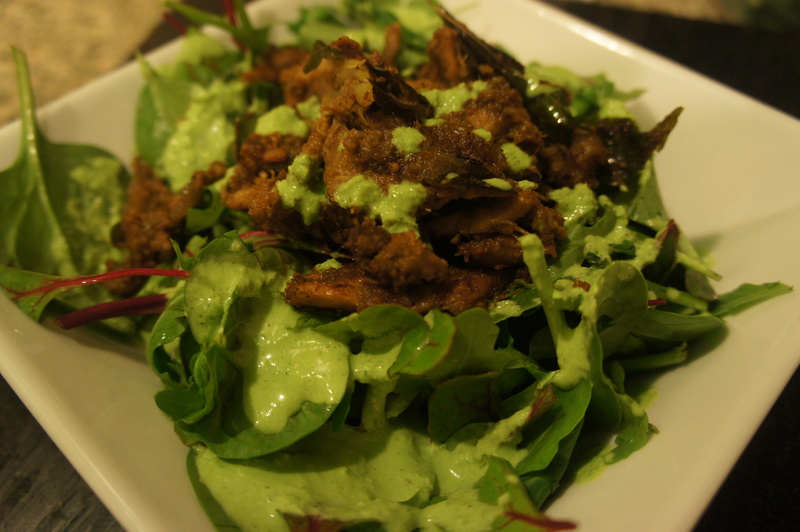 Place warmed left over chicken pieces over salad leaves of choice and drizzle the dressing over. Enjoy. Some of the things we look forward to during the English summer – strawberries and cream at Wimbledon, asparagus and Jersey royal potatoes. Tonight we had 2 out of the 3 treats and I managed to whisk a hollandaise sauce for the first time. I expected to scramble the eggs but was pleasantly surprised with the outcome (next challenge will be to make a poached egg breakfast with ham and hollandaise). If you have never made this sauce try the recipe below which was straight forward (recipe courtesy of Love Food – Sauces). Pour the vinegar and water into a small heavy-based saucepan and bring to the boil. Boil for 3 minutes, or until reduced by half. Remove from the heat and leave to cool slightly. Put the egg yolks in a heatproof bowl and beat in the cooled vinegar water. Set over a saucepan of gently simmering water, ensuring that the the base of the bowl does not touch the simmering water. Cook, stirring constantly with a wooden spoon, until the mixture thickens slightly and lightly coats the back of the spoon. Keeping the water simmering, add the butter, a piece at a time, stirring until the sauce is thick, smooth and glossy. Add a little lemon juice if the mixture is too thick and to give a more piquant flavour. Add salt and pepper to taste and serve warm. 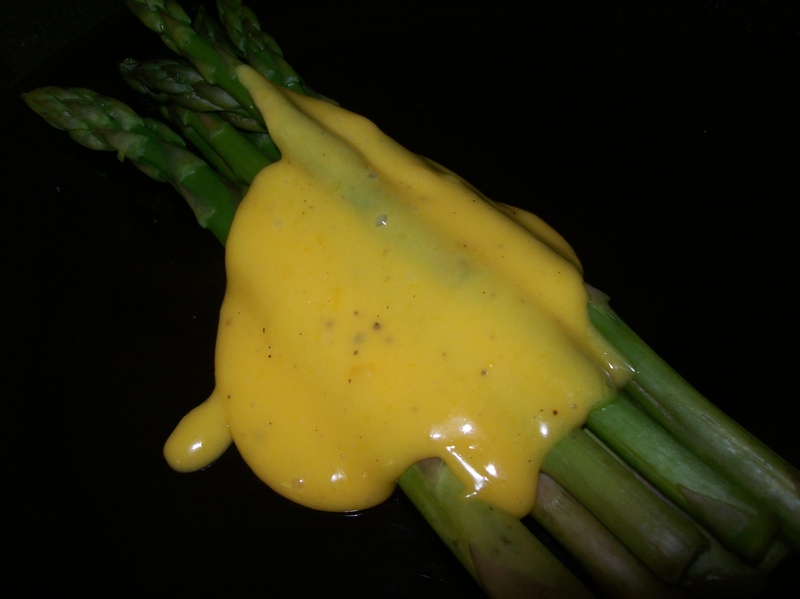 We had the sauce over some steam asparagus . 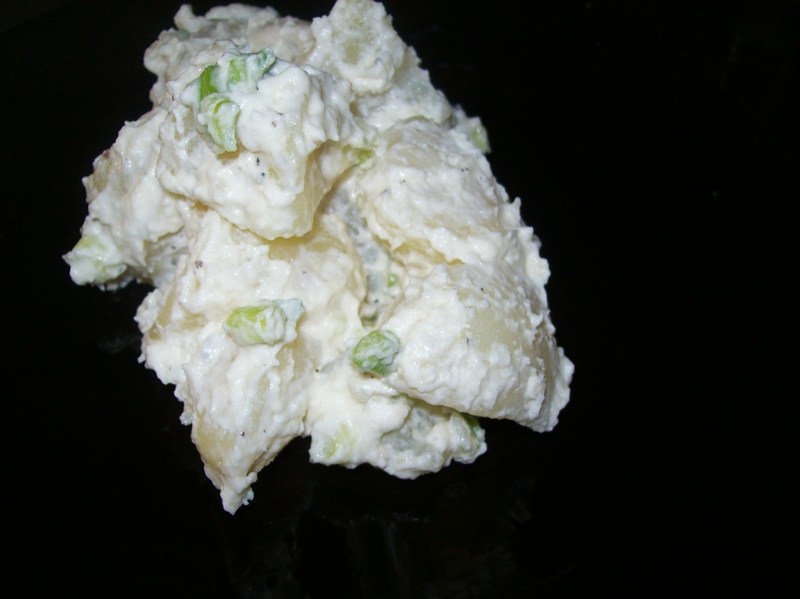 Place boiled cubed potatoes in a large bowl. Add the remaining ingredients and give it a good mix. Enjoy.